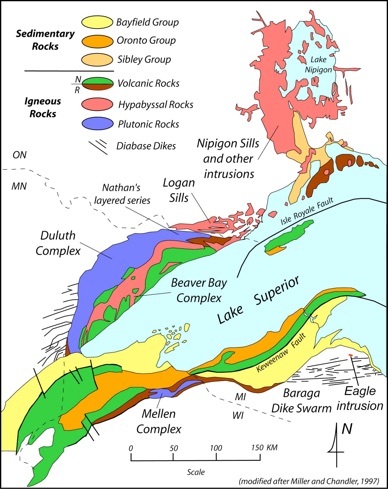 What are the globally significant geological issues of the Keweenaw and Isle Royale? What is uniquely interesting about this spot in time and place? What big ideas, applicable elsewhere, emerge from this geology? 1.Rodinia, a Proterozoic supercontinent, blanketed Earth’s mantle, and the higher heat flow of 1.1 billion years ago triggered huge volumes of hot magmatism from the mantle, first giving rise to ultramafic dike swarms, then basalts in huge quantities. These dikes split the great supercontinent, but a nearby continental collision (Grenville) was apparently what prevented the formation of an ocean basin. 2.Large Scale Flood basalts occurred for a brief period, lasting only a few million years in the Keweenaw and Isle Royale. These eruption rates, much higher than average, apparently were driven by a mantle plume. They are similar to other continental flood basalts and mafic large igneous provinces (LIPs) in these respects. There are volcanic, plutonic, and sedimentary elements to the mantle plume and rifting (see map, below). 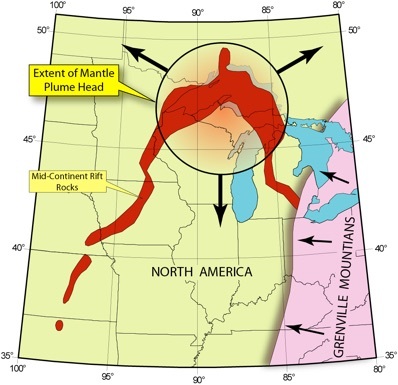 3.Ponding of magma happened in a great crack—the midcontinent rift basin, locally called the Keweenaw Rift. 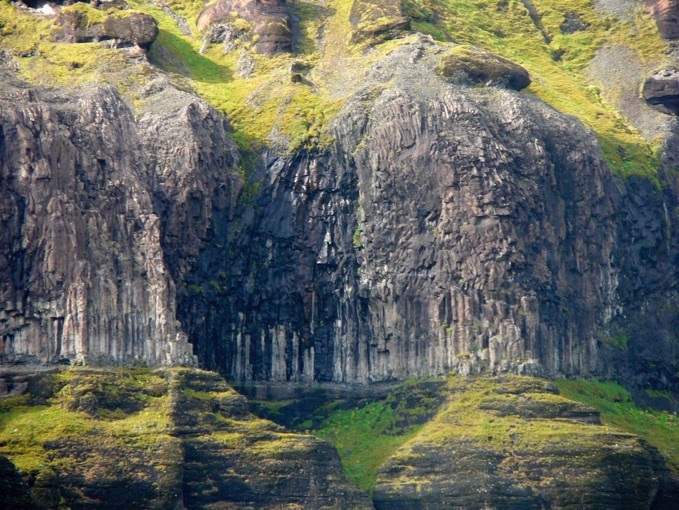 Because lava solidifies by heat loss from the lower surface where it is contact with the cold ground and the upper surface where it is in contact with the air, thick lava flows cool much more slowly than thin ones, because the massive flow interiors, far from the top and bottom of the flow, are shielded from heat loss. 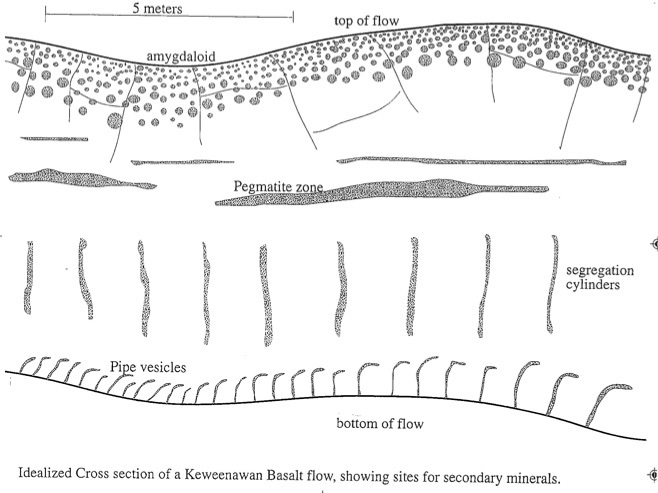 The Keweenaw Rift has flows as thick as 1200 ft, thicker than those found in other mafic LIPs. 4. The in situ differentiation within the largest lava flows may have occurred because of the existence of a large ponded magma body (not unlike a magma ocean) within the rift valley for perhaps up to a millennium. This results in pegmatite or dolerite horizons within the large flows, features that are not common in younger flood basalts. Vesicle cylinders and segregation cylinders are also conspicuous features of these ponded flows which occur in the lower parts of the flows, reflecting compaction of a dendritic mush consisting of ophitic crystals. 5. The hotspot (mantle plume head), along with the rifting it caused, created a big, elongate hole in the continent, that was partially filled with basalt and redbed sediments. This hole has persisted until now and it is this hole that coincides very closely to the position of Lake Superior. 6. An unexplained unique aspect of this rift situation is native copper mineralization. Though other rifts have all of the other mineral deposit types of the 1.1 Ga Lake Superior area, none has native copper. We are puzzled by this cosmic geochemical oddity. What happened to the sulfur usually found with chalcophile elements? 7. Fossils are difficult to find in Keweenawan rocks, generally, but cyanobacteria are conspicuous. Stromatolites within the rift basin here are associated with an oxidized ocean and an atmosphere that was holding at least some free oxygen. Following the redbeds of the rift were the multiple Snowball Earth events. 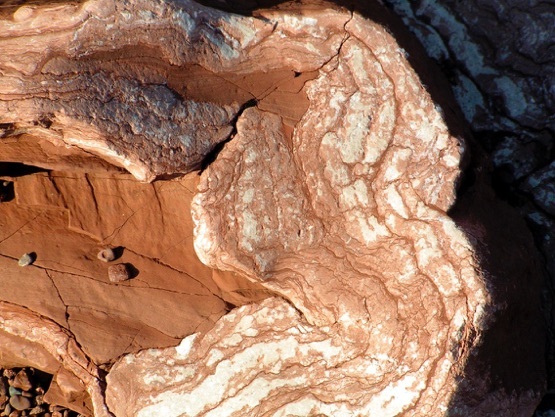 Keweenawan Stromatolite from the Copper Harbor Conglomerate.